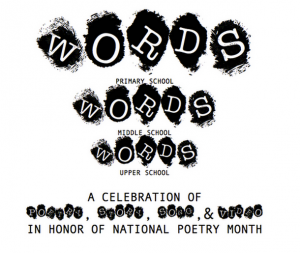 The English Department is pleased to present its 5th annual celebration of National Poetry Month called Words, Words, Words. 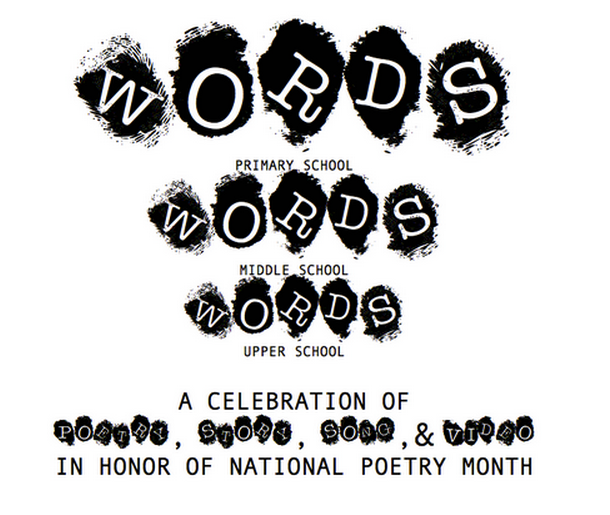 Please join us for words in poetry, story, lyrics, and maybe video! *Please note that because of the often mature content of US performances, the 7:00 – 8:30 p.m. portion of the program is reserved for US students only. Therefore, only US students and adults should be in the audience. Become a Part of the Celebration! If you are a student in Primary School, Middle School, or Upper School who would like to read a poem or story of your own or a personal favorite from someone else (and/or if you would like to perform a piece of music), you should sign up here so that we can build the program around you and your words, in whatever form they take! Questions? Any questions can be directed to Mr. Inouye([email protected]) or Ms. Holum([email protected]).